At long last, Janelle Monáe -- the inimitable, award-winning, songwriter, performer, producer, CoverGirl and avant-garde funkstress -- is back again, ready to release her another full-length "emotion picture" to the masses. But as always, Janelle is not ready to talk about music just yet. She'd rather talk about her past and how those fertile powerful experiences forced her to create her coming album "The Electric Lady." 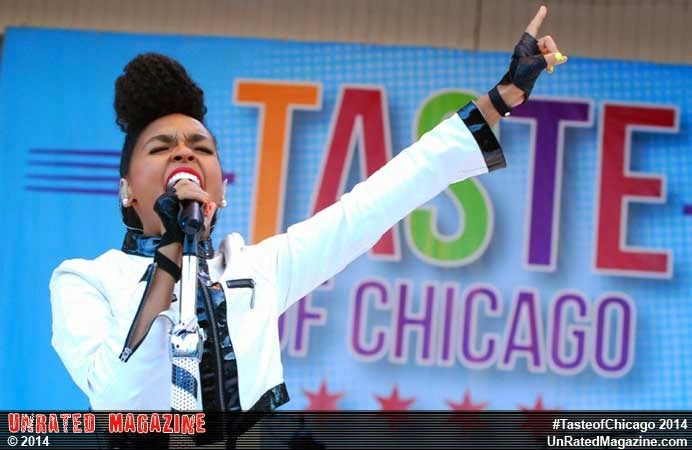 According to Monáe, "I went back to Kansas City after my tour for my debut album 'The ArchAndroid.' And when I looked around me, I decided I wanted to make a raw, revealing album all about my life and the things I'd experienced in my community -- about the laughter in the parks, the jams bumping in the cars, the jokes told over kitchen tables, all the life and warmth and struggles I felt there. But I also wanted to figure out how to take Kansas City to the future...like a surreal Parliament album with lyrics by Octavia Butler and album art by Salvador Dali." As time passed, Monáe found herself increasingly drawn to the stories and experiences of the strong women in her life, and their ability to electrify and inspire individuals to do the right thing. "At some point I realized that the true heart and glue of the community were the women. My mama and grandmamma and my aunties and who to this day, are some of the most powerful beings on the planet. Under their guidance, I went from cleaning houses everyday in my maid outfit to the world-traveling performer I am today. They made me believe in myself enough to move from Kansas and pursue my dreams. A lot of folks think I work hard onstage because of James Brown. But they've never met my mother!" I have hundreds of these paintings with the same feminine figure over and over...this glowing Technicolor woman...seen from behind...regal, powerful and electric...My colleagues and friends told me to name this mysterious figure because she seemed to be a totem, a powerful symbol for me. So I named her 'The Electric Lady,' and that's where the album's title came from." As she began the audacious task of following up on her acclaimed debut LP "The ArchAndroid" -- an album that topped critic's lists in 2010 all over the world -- she took along some trusty, brave companions: the original music producers of "The ArchAndroid," Nate "Rocket" Wonder and Chuck Lightning of Wondaland Productions. And together they crafted a new strain of jamming music they called "ish." In the hip hop community, "ish" is a euphemism for the profane four-letter word for excrement, but as Monáe explains, they set out, like proverbial alchemists, to turn lesser substances into gold. "This entire project was produced by Wonder & Lightning. We set out to make a soundtrack for the Obama era, something that spoke to the beautiful, majestic and revolutionary times that we're living in. The musical language we're speaking now is called ish. In the African-American community, we've been turning left-overs (like chitlins) and social depredation (like poverty) into delicacies and fine art for years. So we just set out to turn the rubbish all around us into something beautiful. Ish is the bowtie on the funk." From the sound of "The Electric Lady," ish is an urgent and dangerous form of dance music, rebel music that forces one to fight, jam, and fall in love. Like on "The ArchAndroid," the sonic textures of the album are varied, and the past and present come together to explode and create a mind-blowing future for pop and soul music. For example, wondrous strings reminiscent of Curtis Mayfield and Bernard Herrmann orchestrations abound, Hendrixian guitar solos soar, Outkast-like raps float over punk rock riffs; defiant socially-conscious lyrics extol the virtues of soul-searching and fighting for change, while the funk simply melts your speakers: 808s boom and Prince-like synthesizers squiggle in your earhole, making it veritably impossible to just sit still. "As we like to say at Wondaland, the booty don't lie. The booty always obeys the LAW OF THE JAM. You can't hate on something that makes your booty move, that makes you jam and have a good time. And the booty will always tell you the truth of a given situation. You can always tell what a community or a person truly believes by just studying the actions of their booties at any given time. They can claim they love this other person or culture, or believe in this peaceful god, or really want freedom, but do their actions prove it? Their actions, what their booties do or don't do, that tells you the truth." The recording process was fun, rewarding, but also strained by Monáe's newfound need to be more courageous and personally revealing in her storytelling. "To do this album properly, I had to revisit some turbulent chapters in my life, deal with some questions and experiences left over from my childhood. There were so many things I had questions about. Sexual things. Racial Things. Gender things. Memories. Things I thought I had left behind me. New things I was discovering. But ultimately I found myself emulating my mother and grandmother and using their strength to surpass my fear. I had to do that before I could write and sing and perform these new songs convincingly. I'm not the kind of artist that can perform something night after night, if I don't believe in it, or if it's not true to me or my experience." Monáe was also inspired and emboldened by her truly amazing collaborators: Roman GianArthur, the wunderkind and Wondaland Arts Society artist-in-residence that, once again, provided the album's magisterial overture; the soul star Miguel, who crooned his way effortlessly to the stars and helped provide a prime baby-making moment on the lush ballad "Primetime"; Erykah Badu, her self-ascribed "twin," who used her cosmic grace and poise to help turn the first single "Q.U.E.E.N." into a female empowerment anthem and a runaway smash; and none other than her lifetime hero, the legendary Prince, who contributed in countless ways, musically, vocally, and most importantly, spiritually -- by conversing with her from his purple telephone in Minneapolis, whenever she was weak and unsure which artistic direction to go. As she worked, Monáe found herself, as always, drawn again into her other love, science fiction, and the exploits of Cindi Mayweather, the heroine of her first EP "Metropolis." In fact, the new album serves as Suite IV and V of her Metropolis saga, and in this chapter, the android hero Cindi moves from self-realization to self-actualization: from the knowledge and owning of her unique superpowers, to actually using them to better the world around her. Monáe says, "I like to think you can hear me using my superpowers this time. And not just talking or wondering about them. "The Electric Lady" is like the big action sequence in the third act of an epic film. Every party this album starts, or every baby born because of it, is actually another victory against the Great Divide." As she continued to work on the album, Monáe found herself displaying these superpowers in new ways in the recording studio, and found that some of her best creative work was done when she was running entire production sessions by herself. "There were key moments like the rap on Q.U.E.E.N. where I needed to be alone. I dimmed the lights, setup the mic and engineered myself. I just let the words and sounds flow through me. Overall, I've been feeling stronger as a producer, as well as writer." In addition, on this album, Monáe had the chance not only to produce herself, but also to produce her collaborators Miguel, Erykah Badu and Prince. "I'm still humbled by the collaborations and partnerships I have on this album. I actually got the chance to produce and write for some of my heroes. And through my recording label the Wondaland Arts Society, I've been executive producing the artists I love. Wondaland artists such as Deep Cotton and Roman GianArthur. I'm proud of the Wondaland movement, and this new phase in my life as an artist, producer, and businesswoman." The fruits and rewards of this artistic journey can be heard in ample measure on the album's courageous, outrageously funky first single "Q.U.E.E.N," which features the queen herself, Erkyah Badu. "Erykah's one of my best friends, and we talk about everything. That particular song really developed from a deep conversation we were having about a woman's place in the world. And how we were expected to be freaks and muses and virgin goddesses all at the same time by patriarchal cultures and religions. Rather than answer all the questions we just decided to jam to them and let the booties decide." Now that the album is complete, Monáe finally has a concrete formula for the Electric Lady that she summed up by turning her first single "Q.U.E.E.N." into an acronym. In Monáe's own words, "An Electric Lady is Quirky, Unafraid, Electric, Epic and Nicety. That's when you're being nice and nasty, noble and naughty all at the same damn time. Because even superheroes need a glass of red wine. Even rebel women need a kiss every once in a while. What's proper and acceptable behavior simply depends on the time of day... and the kind of week you've been having."